The moon has long played a mystical role in the lives of many people and cultures and that mysticism has formed the basis for more than a few online slots we’ve reviewed in the past. There’s always room for one more of course and so we are pleased to bring you news of Moon Shadow, a Barcrest game which you can read all about below. 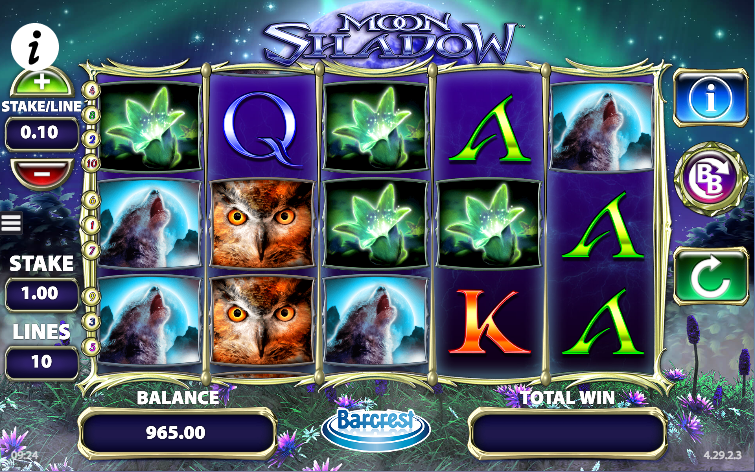 Moon Shadow is a five reel slot with three rows and up to ten paylines; it all takes place at night of course and behind the gold-framed reels there’s a huge fill moon watching over various nocturnal plants. There are three theme related symbols including an orange-eyed owl, a howling wolf and a creepy green plant; Q, K and A make up the lower values. The wild symbol is a huge red moon, it only appears during the free spins and it will substitute for all others except the scatter – that’s represented by a girl wearing a tiara who will activate the main feature. This is triggered by landing three of the girl scatter symbols anywhere on reels one, three and five; you will now receive ten free spins but before they start one symbol will be randomly picked to act as the wild. Each scatter symbol which lands on reel five during this round will award between four and eight extra spins which is clearly good news. Moon Shadow includes Barcrest’s Big Bet feature which gives players the option to pay a little more for five linked spins with the number of paylines increased to twenty. This also has the effect of increasing the RTP to 98.01% from 96.07%. 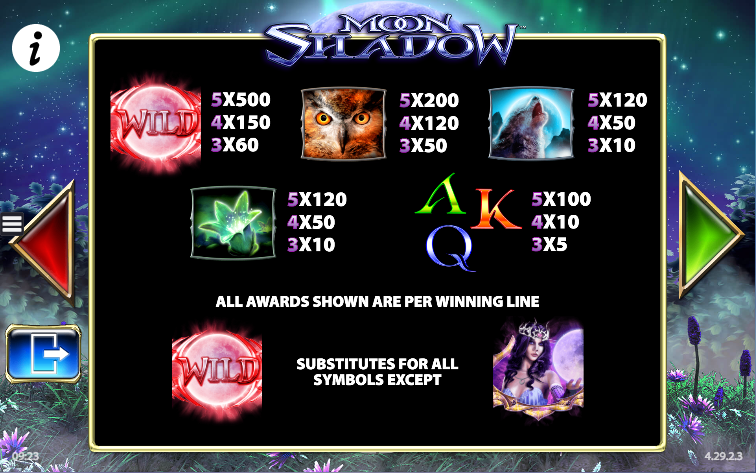 Moon Shadow is a pleasant-enough slot and a good use of your time if you’re after a relaxing gaming experience; go for the Big Bet if your budget will allow because of the extra action and increased winning chances.